Dealing with your household clutter is a common issue that all people need to address. More than a simple practical measure that makes it easier for you to move around your home, de-cluttering is a way to free your mind and create a healthy relationship with your personal space. While we don't all want to live in an empty house or embrace a minimal aesthetic, there are lots of ways to downsize and trim the fat in your life. Not only will this make your home seem bigger and more attractive, it will also remind you of the things, and people, that really matter in your life. In order to find the perfect level of clutter for your home and your mind, perhaps you should do a little mind trick and work backwards. Instead of constantly trying to fill up your space by adding to your favourite belongings, perhaps you should think about what could be taken away. If your possessions were stolen or destroyed in a house fire, what would you really miss? What would you replace first if you lost it all? While lots of people do this when they downsize to a smaller property, it can be done at any time to trim excess from your life. If you haven't used something for months or even years, does it really deserve to be taking up space in your home? 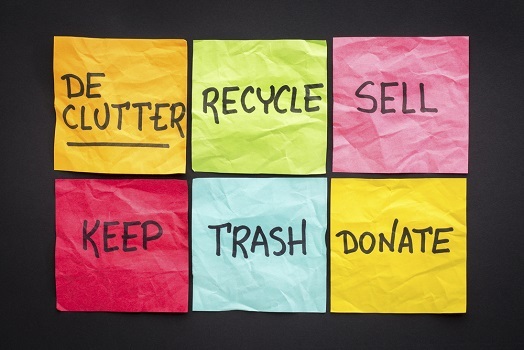 Along with starting with an empty slate, it's much easier to manage your clutter when you have a regular schedule. Clutter is one of those things that just seems to happen over time, with de-cluttering efforts needing to be carried out at regular intervals. Try to work in small focused bursts rather than long sessions. Pick a room at a time instead of attempting to de-clutter your entire house. Start to integrate de-cluttering into your everyday lifestyle so it's something you just do rather than a chore you try to avoid. Last but not least, it's important to see this process in a positive light. You're not just getting rid of things, you're giving yourself the space to enjoy the things that really matter.